2018 DAY OF GIVING has ended! OSHER Lifelong Learning Institute has raised $ 11,075 from 33 gifts! ARE YOU ALL IN FOR OLLI? YOU can help build momentum for the causes you care most about by saving the image below and sharing it on your social media sites to show your Bronco pride! The Osher Lifelong Learning Institute at Santa Clara University – OLLI@SCU – is a vibrant community of more than 1100 adults aged 50 and better. Your gift helps members pursue their love of learning through classes, events, lectures, and travel. Last year, OLLI members and friends donated $6,285 on Day of Giving, earning OLLI a bonus of more than $400, which allowed us to host a free event with an exciting speaker, as well to continue to build our program and offerings. Go to the OLLI website, scu.edu/osher for the latest happenings! 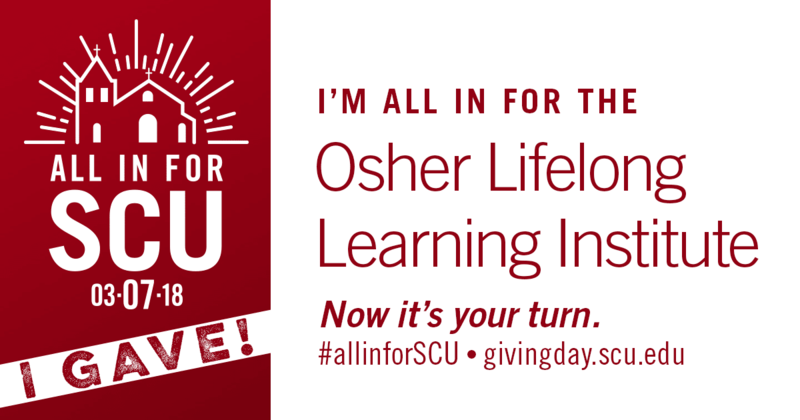 We’re counting you to join your fellow OLLI members and Go ALL IN FOR OLLI@SCU on March 7! See what people are sharing about 2018 DAY OF GIVING! If we receive 5000 gifts before midnight, an alumna from the Class of 1989 will contribute $25K to the Santa Clara Fund. Congratulations to Kara H. '17 for winning the Early Riser Challenge! Kara has chosen Women's Ultimate to receive an additional $500. Congratulations to Angela S, parent of a 2013 grad, for winning the 111 at 11:00 Challenge. Angela has chosen the Ignatian Center to receive an additional $500. Congratulations to Justin O, Class of '18, for winning the Picnic Basket Challenge! Justin has chosen the Fr Coz Endowed Scholarship to receive an additional $500 in support. Congratulations to Serena C, Class of '16 for winning the Grill and Chill Challenge! Serena has chosen the Miller Center GSBI Fund to receive an additional $500 in support. Congratulations to Jenny Y, Class of '14 for winning the It's 5 o'clock...somewhere Challenge! Jenny has chosen the Mechanical Engineering Department to receive an additional $500 in support. Total dollars raised by participating group. Or you can contact us at giving@scu.edu.